Welcome NATA Members and Friends! 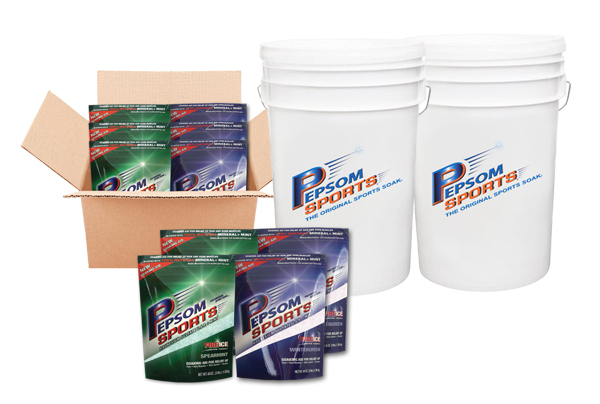 Pepsom Sports is the #1 Sports brand of Epsom salt for first aid usage blended with 100% natural ingredients, such as Spearmint and Wintergreen. Our soaking aid is formulated to focus on the needs of athletes and athletic trainers to help aid in relief and promote recovery. We look forward to this partnership as we continue to service and deliver our premium products to athletic trainers of all sports. Pepsom Sports has been used by world championship teams and trusted by some of the most decorated athletic trainers in the world. U.S. Olympic teams even brought cases of Pepsom all the way to London! Our key ingredient, Epsom salt, is a mineral (magnesium sulfate) known to relieve inflammation, soreness and stress. Pepsom Sports' FIRE*ICE formulas, blended with Epsom salt, helps improve recovery time and increase the body's magnesium levels that have been lost from workouts or competition. Athletic trainers use Pepsom Sports in hot and ice baths to optimize an athlete’s performance while boosting recovery from overexertion and injuries. So what does this all mean? 70% of athletic injuries are sprains, strains, and contusions. Soaking in Pepsom provides a positive effect on the recovery of those common injuries for the next day and days to come. Pepsom and the NATA members share a common goal - keep athletes healthy so they perform at their highest level. We are confident that using Pepsom products will achieve that goal. 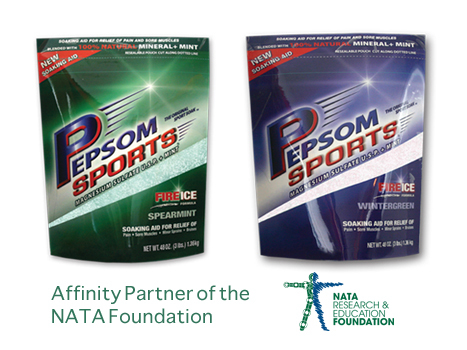 "Pepsom Sports is honored to be an Affinity Partner of the NATA Foundation. A percentage of our proceeds will go to the NATA Foundation." Spearmint is an aromatic herb known for its calming and therapeutic properties. It contains valuable vitamins, antioxidants and nutrients that promote health. Spearmint may help reduce swelling due to nerve or muscle pain. The relaxing properties of Spearmint may induce relaxation in muscles of the abdominal region. The active agent in Wintergreen, Methyl Salicylate, is known to eradicate pain. It also increases circulation of the blood and brings warmth to the area, helping to fight pain. Wintergreen can help induce relaxation as well as provide relief from muscular cramps. Its analgesic properties include fighting soreness, joint discomfort, arthritis and stress. Pepsom Sports is currently available with special athletic trainer pricing in convenient 1- to 3-lb pouches for individual usage and large re-sealable pails for training facilities. We can design custom orders for any team and any sport. Interested in Pepsom Sports for your team? Fill out the contact form below or email pepsom@3sawsinteractive.com. For further inquiries, call 3SAWS Interactive at (786) 420-2188. © Pepsom, 2018. All Rights Reserved.